Karl W. Flessa (Dept. of Geosciences, University of Arizona, Tucson, AZ 85721 USA). Dena M. Smith (Dept. of Geosciences, University of Arizona, Tucson, AZ 85721 USA). We compared 1980 and 1995 levels and patterns of employment of paleontologists, geophysicists, and geochemists in 564 U.S. academic institutions. Employment of paleontologists was stable, while the number of academic positions for geophysicists and geochemists increased. Colleges and universities that employ paleontologists tend to employ only one, while geophysicists and geochemists are more likely to have colleagues in their own discipline. The proportion of senior faculty members in all three disciplines has increased. Recruitment of assistant professors declined in paleontology, while it remained stable or increased in geophysics and geochemistry. Less information is available on the status of academic paleontology outside the U.S. Numbers of paleontology faculty in paleontology in Western Europe, Australia, and New Zealand appear to be either stable or declining slightly, while economic and political pressures threaten academic positions in countries with developing economies. The continued success of academic paleontology depends on paleontologists developing collaborative teaching and research efforts with nonpaleontological colleagues, expansion beyond traditional course offerings, and increased employment in biology departments. Predicting the future is never easy, but, as paleontologists should know, the record of the past can reveal trends and patterns that can be useful in understanding processes that may affect the future. Although no global database on employment of paleontologists exists, the American Geological Institute (AGI) has tracked the number, academic affiliation, and rank of paleontologists and other earth scientists in North America since AGI's first annual directory in 1952. We examine here the changes in employment patterns of United States academic paleontologists from 1980the first year in which AGI listed disciplinary affiliationto 1995. We also compare these changes to those occurring in two other disciplines: geochemistry and geophysics. We freely admit that our sample is an incomplete and parochial sample of global patternsas all literature-based compilations are likely to be. Nevertheless, our analysis has the following virtues: 1) it is based on data rather than a personal collection of anecdotes; 2) the sample is large479 paleontologists (in 1995) among 564 academic institutions; and 3) the economic pressures, research directions, and teaching opportunities affecting U.S. academic employment are likely to be similar to those affecting academic employment in other countries. At the very least, our analyses and interpretations should prove to be a useful basis for further discussion. We compared the 564 academic institutions that were listed in both the 1980 and 1995 Directory of Geoscience Departments (anon., 1980; Claudy 1995). We did not include museums, research institutes, or other nondegree-granting organizations. Our sample includes both Ph.D.-granting institutions, and institutions that grant MS, BS, and BA degrees as well as certificates from two-year community or junior colleges (Table 4). Table 4. 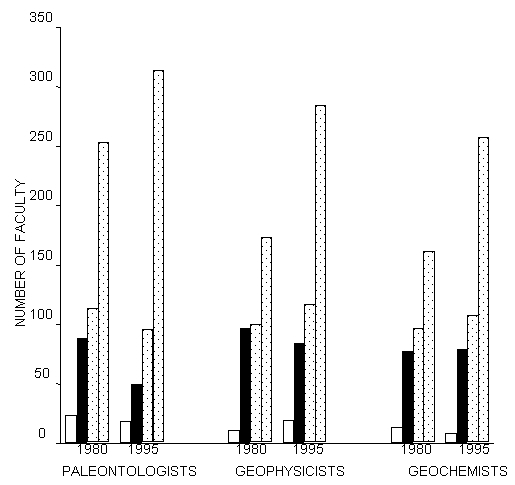 Employment of paleontologists, geophysicists, and geochemists in U.S. academic institutions in 1980 and 1995. We were not able to tabulate paleontologists employed as faculty members in biology, zoology, anatomy, botany, anthropology, or other nongeoscience departments. Thus, we suspect that our survey failed to capture the many vertebrate paleontologists and paleobotanists on the faculty of nongeoscience departments. Thus, our sample is probably biased toward invertebrate paleontologists. We included only those institutions that were listed in both editions because we wished to avoid confounding changes in employment with the increased effectiveness of coverage in AGI's directories. Analysis of only the same 564 academic institutions necessarily omits paleontologists employed by academic institutions that arose since 1980 and survived to 1995. We suspect that very few paleontologists are employed by what is likely to be a very small number of such institutions. Similarly, we did not count paleontologists in academic institutions listed in the 1980 directory but not listed in the 1995 directory. The absence of an entry in 1995 could have resulted from either the institution's demise or, more likely, its failure to respond to the annual AGI inquiry. We tabulated the number of paleontologists (AGI codes 401-411), geochemists (201-210), and geophysicists (301-309) employed as lecturers, assistant professors, associate professors, and professors. Individuals in the AGI directory affiliate themselves with a particular specialization within a larger discipline. Paleontology includes general paleontology, biostratigraphy, micropaleontology, paleobotany, palynology, quantitative paleontology, vertebrate paleontology, invertebrate paleontology, paleobiology, paleoecology, paleoclimatology, and geobiology. Individuals may list themselves with only one specialization. We did not include emeritus, adjunct, research, or other nonregular-status faculty members. The extent to which such irregular faculty members are actually paid by the academic institution varies greatly, and many have affiliations with more than one college or university. Employment of paleontologists in our survey was stable: the 1995 figure of 479 academically employed paleontologists is essentially the same as the value of 481 in 1980 (Fig. 1). Employment among academic geophysicists and geochemists, however, increased significantly during this same period, an increase of 32 percent for geophysicists and 29 percent for geochemists (Table 4, Fig. 2). Thus, despite stable employment levels for paleontologists during this 15-year interval, they have become a smaller proportion of the academic geoscience community. Geophysicists and geochemists outnumber paleontologists at Ph.D.-granting institutions, while paleontologists are often twice as frequent at non-Ph.D.-granting institutions than geophysicists and geochemists (Table 4). Although geophysicists and geochemists increased in number at both Ph.D. and non-Ph.D. institutions, their growth was greatest at non-Ph.D. institutions (geophysicists +81 percent; geochemists +52 percent); paleontologists showed no significant change at either Ph.D. or non-Ph.D.-granting institutions (Table 4). in 1980 (white) and 1995 (black). 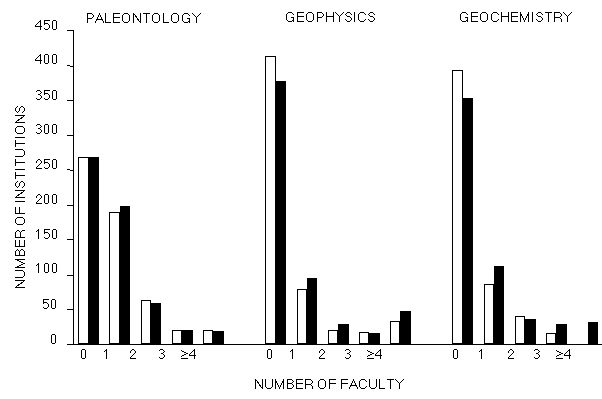 The distribution of paleontologists among institutions differs from that of geophysicists and geochemists (Fig. 3). While a slight majority of all 564 institutions employed at least one paleontologist in 1995, most employed neither a geophysicist (67 percent) nor a geochemist (63 percent). The largest proportion of institutions employing paleontologists employs only one of them. Even at Ph.D. granting institutions, the lone paleontologist is the rule (34 percent). In contrast, solitary geophysicists and geochemists are relatively rare (18 percent and 24 percent, respectively). Inasmuch as the total number of geophysicists (507) and geochemists (454) in our survey is comparable to the total number of paleontologists (479) (all figures are from 1995), it follows that geophysicists and geochemists are more concentrated among institutions. This is especially evident when comparing the number of institutions housing four or more paleontologists (19) to those containing four or more geophysicists (47) or geochemists (32). Geophysicists and geochemists occur in groups; paleontologists are more likely to be solitary. ranks in 1980 and 1995. 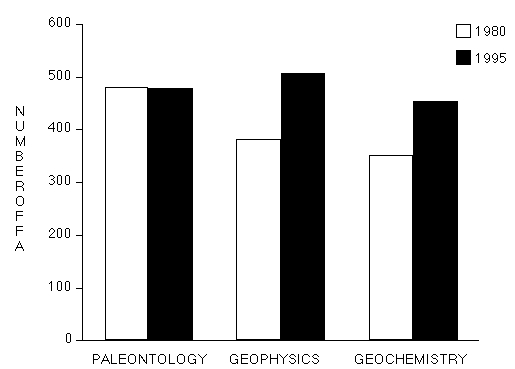 The distribution of paleontologists among academic ranks also differs between paleontologists and their geophysical and geochemical colleagues (Fig. 4). All three disciplines show an increase in the number and proportion of faculty in the most senior rank of professor. At the more junior ranks of assistant and associate professor, however, the proportions of geophysicists and geophysicists have remained essentially stable, while the number of paleontologists has decreased sharply (a 43 percent decrease in the number of assistant professors and a 16 percent drop in the number of associate professors). Recruitment of entry-level academic paleontologists has declined relative to the other two disciplines. Given the similar levels of employment among the three groups, the typical academic paleontologist is becoming older than the typical academic geophysicist or geochemist. Information gathered from our non-U.S. colleagues at the Frankfurt meeting suggests that the number of academic positions in paleontology in other countries is, at best, stable. Small decreases appear to characterize many countries in Western Europe, Australia, and New Zealandthe result of either declines in student numbers, consolidation of paleontology programs into fewer institutions, or both. Academic positions in paleontology (and other geoscience disciplines) appear to be most threatened in countries undergoing severe economic dislocations in eastern Europe and the former Soviet Union countries and in countries where the petroleum industry was once the principal employer of graduates. There is only small comfort in these figures. Contrary to the conventional wisdom, there has not been a significant decline in the number of academic paleontologists in the U.S. The employment picture is remarkably stable for the time interval considered here. The past 15 years have not been a period of growth in U.S. academia, so a lack of growth in faculty positions in paleontology should not be surprising. Nevertheless, the number of geophysicists and geochemists employed by U.S. academic institutions has actually increased during the past 15 years and that growth does not appear to have occurred at the expense of academic positions in paleontology. Advocates for a greater curricular and research emphasis in geophysics and geochemistry have been effective at increasing the representation of those disciplines in U.S. colleges and universities. The best that paleontologists can say is that they have maintained their numbers. But the nearly constant employment of paleontologists has resulted in a decrease in their proportional representation in geoscience departments. The relatively greater representation of paleontologists in non-Ph.D.-granting institutions and the high proportion of institutions that employ only one paleontologist probably reflects the large population of paleontologists (compared to that of geophysicists and geochemists) at relatively small colleges. This distribution among institutions may be a measure of the teaching versatility of paleontologists relative to that of geophysicists and geochemists. In addition to basic and advanced courses in their own field, paleontologists at small colleges may be called upon frequently to teach introductory level physical or historical geology, stratigraphy, sedimentology, environmental geology and other soft-rock courses. Although such versatility enhances the employability of paleontologists at small colleges, note that the most dramatic increases in academic positions for geophysicists and geochemists have taken place at non-Ph.D. granting institutions. Any presumed lack of teaching versatility among geophysicists and geochemists has not seriously retarded the growth in the number of their academic positions. We suspect that one of the principal threats to growth or even stability in academic paleontology is the phenomenon of the lone paleontologist at many colleges and universities. Such individuals may well be versatile teachers, but unless they have developed collaborative teaching or research efforts with their nonpaleontological colleagues, their academic position is somewhat more likely to be lost to a nonpaleontologist upon their retirement. The most disturbing trend evident in these data is the decline in assistant and associate professor positions in paleontology. The increase in the number and proportion of professors in all three disciplines is a consequence of the promotion of individuals who may have been initially hired more than 12 years ago, the large number of academic paleontologists originally hired in the late 1960s expansion of college and university faculty, and the abolition of mandatory retirement for college and university faculty in the U.S. While retirement of professors of paleontology has been more than compensated for by promotion of already-hired assistant and associate professors during the past 15 years, many of those assistant and associate professors have not been replaced by new recruitment at those two more junior ranks. In contrast, the stability or growth of academic positions in geophysics and geochemistry has come about by growth in junior as well as senior level positions. Advocacy for new and replacement positions in geophysics and geochemistry have been more effective than arguments for positions in paleontology. If this trend continues, the number of academic paleontologists will eventually decline as the more senior paleontologists retire and are not replaced in kind. While it is easy to spot the disturbing trends in academic employment of paleontologists, providing a solution is more difficult and controversial. The complexity of the problemeven within a single countrysuggests that more than one solution may be necessary. We offer the following solutions. 1. The typical lone paleontologist can best secure a position for the next academic generation by developing collaborative teaching and research efforts with nonpaleontologists. Especially fruitful collaborations may even be effective in increasing the number of paleontologists at that institution. More traditional research efforts in descriptive paleontology and biostratigraphy often do not lend themselves to such collaborations, whereas efforts in low-temperature biogeochemistry, paleoclimatology, and extinction studies may prove more fertile ground for collaborative efforts. Paleontologists may need to learn to be better team players. Funding agencies and professional societies should take note of this demographic phenomenon. The health of paleontological education and research may be fostered by facilitating greater professional development through offering short courses, the development of research or educational partnerships among nearby institutions, shared facilities, and greater use of the Internet to establish virtual institutes of paleontology. 2. Offering more introductory-level courses and courses for nonscience majors on such topics as dinosaurs, extinctions, or global change may better use the teaching versatility of paleontologists. Most paleontologists are well equipped to teach in these popular areas, and such efforts will yield much greater student enrollments than courses in descriptive paleontology or biostratigraphy (or geophysics or geochemistry, for that matter). Teaching across disciplines by integrating paleontology with statistics, technical writing, evolution, or other topics may also strengthen course enrollments. Education in paleontology must reach beyond preprofessional training if we wish to justify our discipline during times when the petroleum industry contracts. Traditional paleontology courses could simply be offered less frequently. Popular and intellectually challenging courses are likely to demonstrate the value of paleontologists to department heads and deans. 4. Our survey did not include those paleontologists employed by biology departments. Anecdotal evidence suggests that paleontologists are finding more positions in such departments now that paleobiology has become recognized for the contributions it can make to understanding macroevolution, extinction, and biogeography. Additional teaching opportunities may appear in areas such as anatomy, biometry, systematics, and invertebrate zoology as biology Ph.D.s in those areas become less common due to the relatively greater growth of biochemistry and molecular biology. While new opportunities may appear in biology departments, some care may be needed to ensure that paleontologists are not simply drawn away from their more traditional employment in geoscience departments. The best solution is more paleontologists in both biology and geology departments. Fundamentally, the future of academic paleontology depends on the initiative and activity of the present generation of academic paleontologists. We must clearly and consistently demonstrate the value of paleontology to the university curriculum. We must also clearly and consistently demonstrate that our research is vital to both the geological and biological sciences. We thank our colleagues at the Paleo21 meeting for providing information on the academic situation in their own countries and are grateful to John Hayes for provoking us to consider alternatives to the present academic regime in the U.S. Anonymous, 1980. Directory of Geoscience Departments, 19th edition. Alexandria, Virginia; American Geological Institute, 186 p.
Claudy, N.H., ed., 1995. Directory of Geoscience Departments, 34th edition. Alexandria, Virginia; American Geological Institute, 544 p.